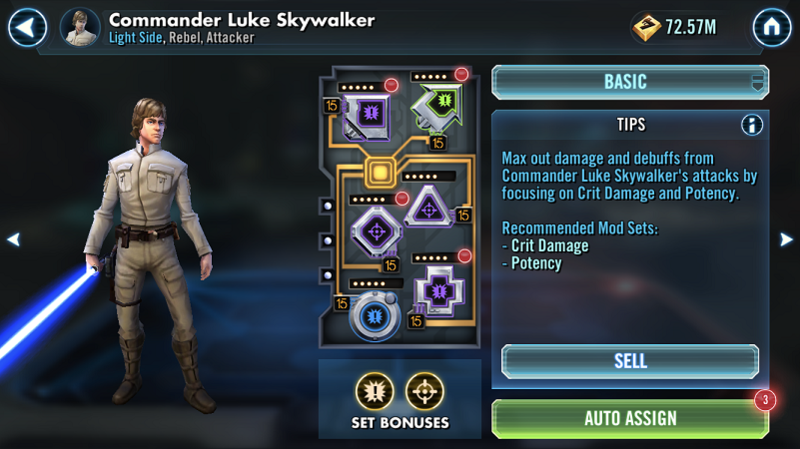 Mods can be viewed within the game under the Character Inventory and then selecting Mods. There are two views available for reviewing mods: Basic and Advanced. Basic Mod View is intended for players who may not have a full understanding of all mod facets. The Basic View can be useful in providing some very basic and generalized tips about which Mod Sets to apply to the viewable character. The “red dot” that appears on mods in Basic View is an indicator that the mod could be replaced with an in-game recommendation. 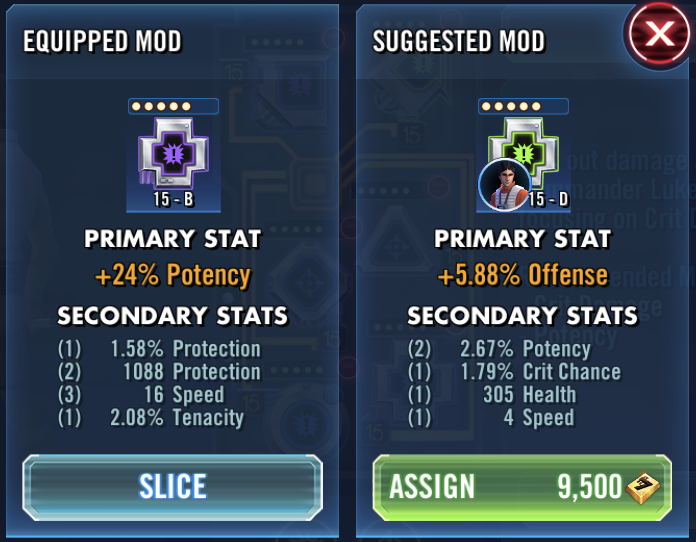 Each mod that could be replaced can be selected individually to see the “Before” and “After” view of the current mod versus the recommended mod. Selecting the Auto Assign button will provide a quick-view of all the mods that can be replaced as well as the credit cost associated with removing current mods to add the new ones. The “Include Assigned Mods” button allows players to let the in-game mod system choose mod recommendations from all available mods instead of just those that are not currently assigned. 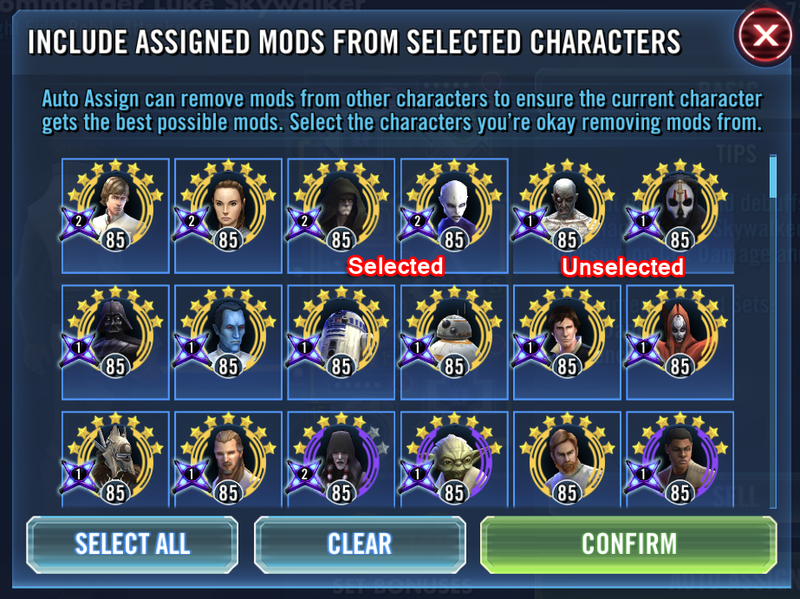 If there are some characters whose mods players do not want to consider in the mod recommendation process, those characters can be deselected from the total list. 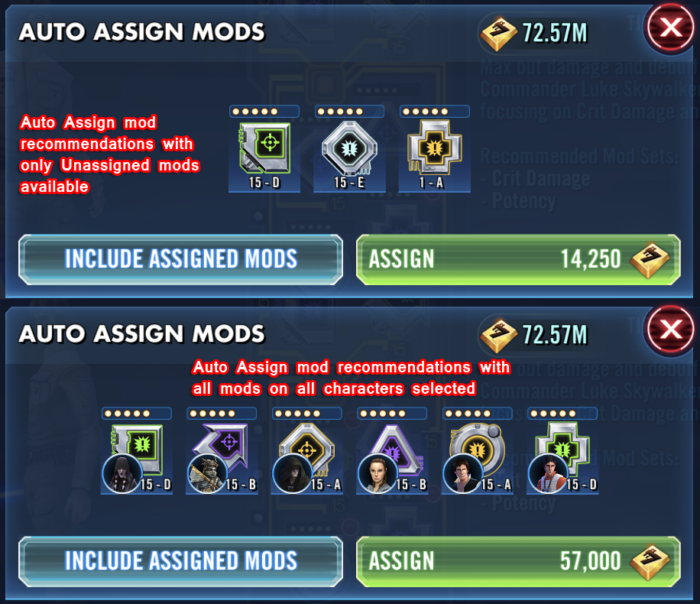 If the “Include Assigned Mods” button has not been selected, the mod recommendations will never include mods that have already been assigned, which can highly affect the quality of the auto-recommendations. These details can be used to make some very basic decisions on assigning mods, but Basic View in general should only be used for very new players who have not learned to make the best use of mods. All mod management should actually be made solely within Advanced View. The Advanced View allows players to see all the Mod Shapes, Sets, Levels, Qualities, and Tiers as well as any Set Bonuses just like Basic View. Unlike Basic View, Advanced View provides detailed character stats with the mods included as well as lets players view all mods that a player has, whether they have been assigned or not. The Only Mods Not in Loadouts will only show mods that are not included in any Mod Loadout (more on Loadouts here). Note: That if a mod is included in any Loadout, that mod will not appear with “Not in Loadouts” selected. All mods can be sold for credits. Review the How to Choose Good Mods page for more details on which mods to keep or sell. All mod management should always be made within the Advanced View of the mod screens. 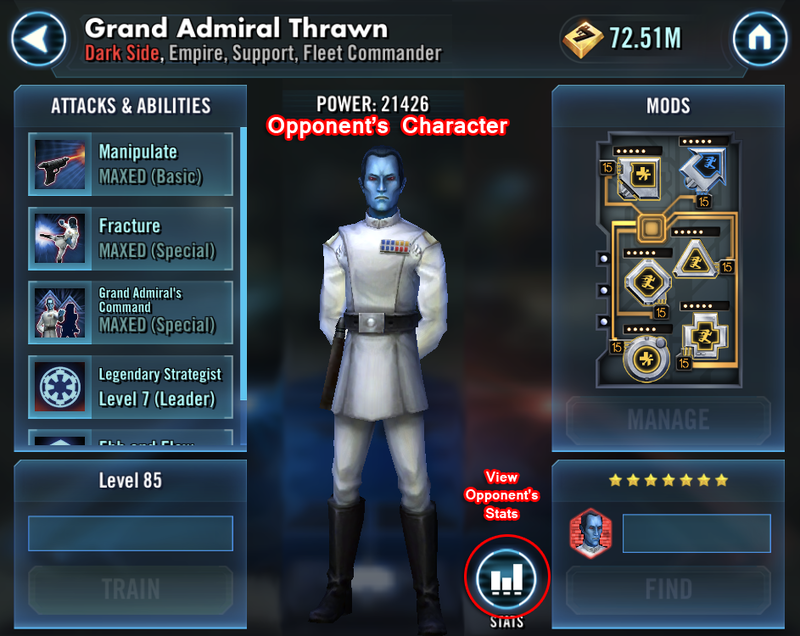 It can be extremely helpful to determine the full strength of Arena opponents by viewing their characters’ mods and stats. By pressing and holding any opponent’s character, that character’s stats will appear in similar fashion to the player’s views. Before jumping into a battle against someone who might be fielding a similar squad that has unmatched Speed or incredible Physical Damage, it is often best to view Arena opponents’ stats through this method to avoid unnecessary Arena losses. To view an opponent’s character stats, tap and hold any character on the Arena screen for the stats screen to appear. Players who are not interested in delving further into mods, may wish to take advantage of a method to instantly mod characters. 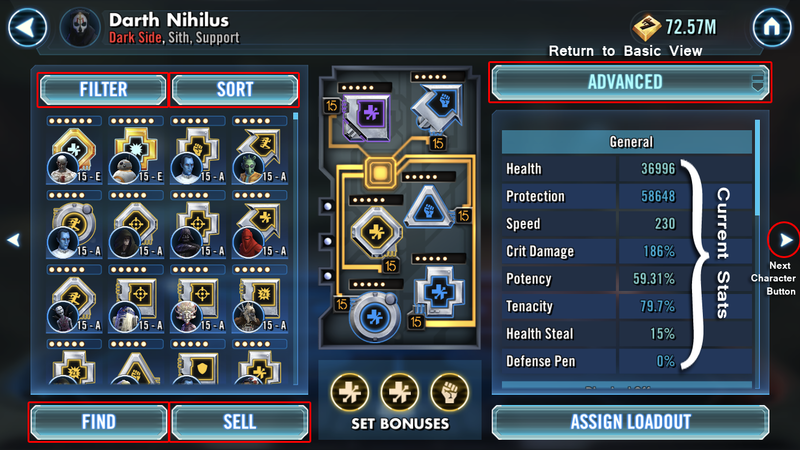 While the mod recommendations are generally relevant with regard to Mod Sets and sometimes Primary Stats, the in-game decision making process of what makes a “good” mod can leave much to be desired. For the Cross shape, CLS currently has a Level 15 5* Purple (5B) Crit Dam set mod with a Potency primary. Key secondary stats on this mod are the +1088 Protection and the +16 Speed. 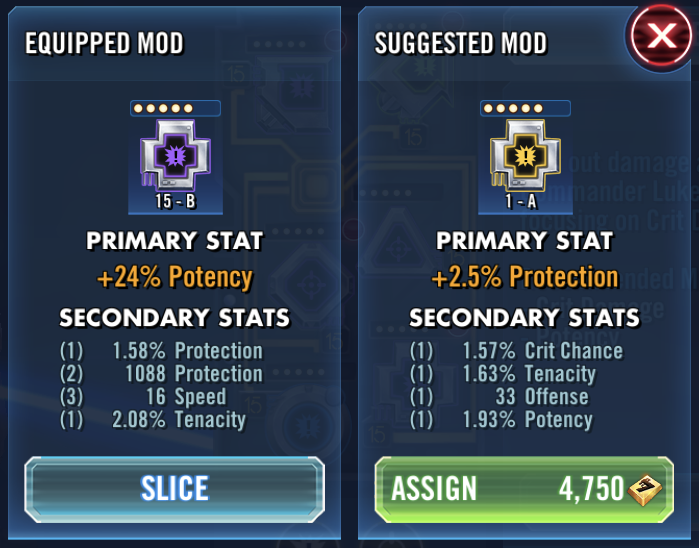 The recommended mod is a Level 1 5* Gold (5A) Crit Dam set with a Protection primary. 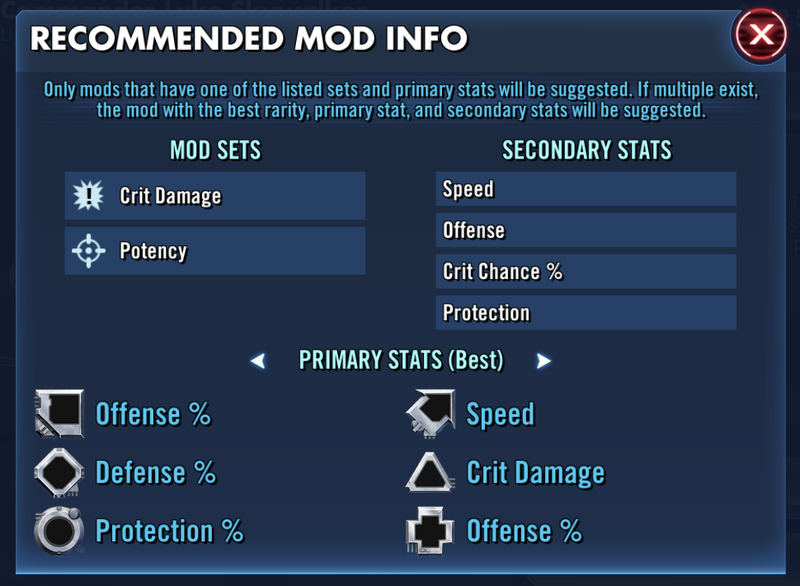 The recommended mod has some minor boosts for the shown stats, but with the mod at Level, there is no telling which of the four secondary stats will increase (more on this in Colors/Qualities) as the mod is levelled towards Level 15. If the Offense secondary stat increases four times, this mod could have some excellent Offense to use, but if each of the secondaries increase one time a piece, all the stats could remain somewhat underwhelming. The most egregious issue of all with this recommendation is that the current mod has +16 Speed and the recommended mod has no Speed secondary! This will be explained in more detailed throughout this guide, but Speed is the single-most important stat in the entire game and to recommend the replacement of a mod that has +16 Speed (an excellent Speed secondary), with one that not only has no Speed, will never even gain a Speed secondary, makes the specific mod recommendation and auto-assign process very suspect. In the above case, the Auto-Assign recommendation automatically selects only mods that have not been assigned to other characters. By selecting the “Include Assigned Mods” button, a new recommendation is available. The new recommendation seems a little bit better in that it has provided a Level 15 mod that also has Speed, but still the recommendation is off. While CLS can benefit from an Offense primary, he also benefits from a Potency primary. The trade-offs between Protection and Tenacity versus Health and Crit Chance are arguable, but the trade-off between +4 Speed and +16 are not comparable. Even if this mod had an undeseriable primary and very weak secondaries, the +16 Speed makes the original mod a far better choice the than recommended replacement. The best way to review mods is through the Advanced View and any players that want to get the most out of mods should familiarize themselves with all the nuances of mods to make the best mod decisions.